If you investigate further, and gaze up into the canopy, you may be able to glimpse a sighting of the songster: a black bird (a little smaller than a Raven) with startlingly red eyes and a slight metallic sheen to its plumage. 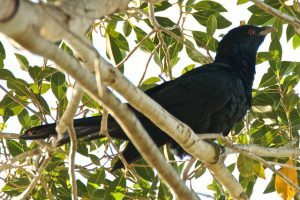 He is an Eastern Koel – a species of migratory cuckoo – and he is singing his name in the hope of attracting a mate, having flown all the way down from the tropics in order to do so. Prior to 2000 the call of the Eastern Koel did not ‘grace’ our city. Indeed, Victoria as a whole has rarely hosted this species in the past, with historical occurrences being few and far between and descried as ‘accidental’ (on the bird’s behalf). Traditionally, south-eastern New South Wales was the southern-most extent of the Eastern Koel’s migration. In relatively recent years, however, Eastern Koels have been arriving in Melbourne in considerable numbers. So why the sudden change? It’s a perplexing riddle, but the answer may lie in the way in which we have designed our cities. Victoria has long been known as the ‘Garden State’ and Melbourne is renowned for its many parks and open spaces. In these greenspaces we have planted a vast array of non-local plants, including many species of tropical trees from northern Australia. The Moreton Bay Fig is a prime example of this. Favoured for its shady canopy and graceful form, it was planted in abundance during the 1800s. As such we now enjoy many mature trees of this grand species. The benefits of these plantings have extended beyond our own use and appreciation however, as the bountiful crop of figs which these trees produce on a yearly basis is of great benefit to our native urban wildlife. Grey-headed Flying Foxes, for instance, seek-out and consume the fruit of the Moreton Bay Fig with great enthusiasm. It is, in fact, a common sight to see their silhouettes gliding between city buildings as they navigate the urban jungle in search of fruiting trees. 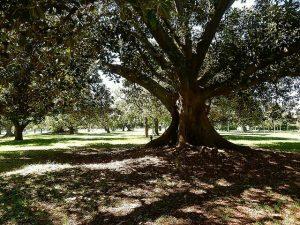 The large leaves and broad canopy of the Moreton Bay Fig makes it an ideal shade tree for parks. Photo by Michael Coghlan via Flickr. Like the Grey-headed Flying Fox, the Eastern Koel also enjoys feasting upon the fruit of the Moreton Bay Fig. Figs, in fact, constitute its primary food source. It seems, therefore, that through selecting our own urban flora we have unwittingly accommodated frugivorous (fruit-eating) fauna such as the Eastern Koel and Grey-headed Flying Fox. As such we have unintentionally extended the range of Eastern Koel and made the Grey-headed Flying Fox a (more-or-less) permanent resident of Melbourne [The latter naturally follows the flowering of eucalypts down the east coast of Australia to Melbourne. In ‘natural’ circumstances it would, however, move back up the coast when the flowering subsided]. It seems, whether we enjoy their repetitive call or not, that the Eastern Koels are here to stay. Their range extension provides an good example of the adaptability of nature and some hope for other species which may need to migrate away from their historic range in the face of climate change.